One of the Google Earth Community (GEC) members called 'Gerardo64' has been compiling a list of links to posts related to issues involving the ecology of Earth. This is a good idea, because there is currently no better program for visualizing problems with our planet than Google Earth. You can see his list of links in his post here, which include issues such as deforestation , temperature anomalies, glacier melt, coral reefs, and even light pollution. There are some good collections in his list, some written about here at the Google Earth Blog (GEB) include: Hidden Logging in Amazon, Environmental Groups Using GE, Sierra Club and Public Land Sale, and Satellite Environmental Data. The deforestation is immens, but dont forget Europe once looked like a massive forest. And so did America. 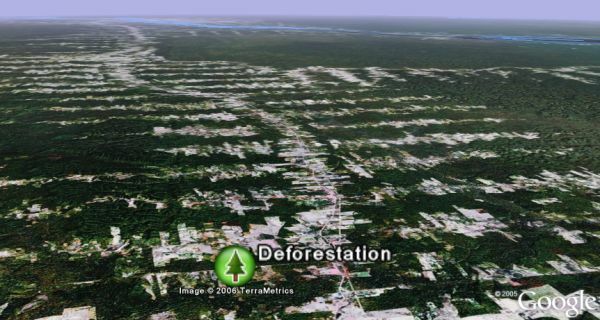 We can do fine without forests, but it is symptomatic of the human population overrunning the little pool we are in. The top of the so-called s-curve is not a nice place to be.